Pope Honorius I reigned as bishop of Rome from 625 to 638 C.E. His papacy was successful in terms of missionary and administrative matters, but created controversy because of Honorius' sympathy with Monothelitism, a doctrine which was later condemned as heresy. Monothelitism held that Christ had two natures (divine and human) but only one will (divine). It was apparently attractive to Honorius because it represented, for him, a middle ground between Monophysitism (which taught that Christ's human nature was subsumed by his divinity) and Nestorianism (which taught that Christ's divine nature was distinct from his character as a human being). Defenders of Honorius argue that it is not clear that he actually endorsed Monothelitism, but only failed to avoid an expression that could be easily interpreted as supporting it. After his death, Honorious himself was named as a heretic at the Third Council of Constantinople in 680. His condemnation later raised serious questions when the doctrine of papal infallibility became an official church teaching. He died October 12, 638. Despite his later condemnation as a heretic, Honorius was much respected during his lifetime, when Monothelitism was viewed as a compromise between the more extreme positions of Monophysitism and Nestorianism. He died with an untarnished reputation. According to the Liber Pontificalis, Honorius came from Campania and was the son of the consul Petronius. He became pope on October 27, 625, two days after the death of his predecessor, Boniface V. He reportedly modeled his papacy after that of Pope Gregory I. Honorius was particularly active in working for the Christianization of the Anglo-Saxons in England, especially Wessex. He also succeeded in bringing the Celtic Irish Easter celebrations in line with the rest of the Roman liturgy. 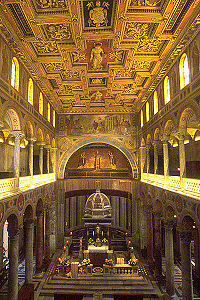 Honorius was also much engaged in the restoration and beautifying of churches of Rome, and his portrait (above) thus adorns a mosaic in the church of Sant Agnese fueri le mura. The festival of the Elevation of the Cross is said to have been instituted during Honorius, pontificate. The church of Sant'Agnese fuori le mura, in which Honorius' portrait is located. He also cared for the temporal needs of the Romans by repairing the aqueduct of Trajan. His surviving letters show him engaged in much business. He supported the Lombard King Adalwald, who had been set aside as mad by an Arian rival. He succeeded with the emperor's assistance in reuniting the schismatic metropolitan See of Aquileia (today in northeastern Italy) to the Roman Church after it had refused to accept condemnation of the Three Chapters by the Second Council of Constantinople (553) during the Nestorian controversy. With regard to England, he sent the future Saint Birinus to convert the West Saxons. In 634 he appointed the future saints Paulinus of York and Honorius of Canterbury as archbishops of those cities, and he wrote a letter to King Edwin of Northumbria, which was preserved by Bede. In 630 he urged the Irish bishops to keep Easter with the rest of western Christendom. The Council of Magh Lene (Old Leighlin) was held as a result. There, Irish churchmen testified to their traditional devotion to the See of Peter and sent a deputation to Rome "as children to their mother." On the return of these envoys, Southern Ireland adopted the Roman use of the year (633). The main issue in Honorius' papacy, however, was the Monophysite controversy. The western church generally rejected this doctrine, which held that Christ's nature was essentially divine rather than essentially human. Nestorianism, on the other hand, held that Christ had two distinct natures, one human and one divine. This was rejected, particularly in the east, as too dualistic. Honorius leaned toward Monothelitism, a formula proposed by the Byzantine emperor Heraclius and Patriarch Sergius of Constantinople, which recognized Christ's two natures but admitted only “one will," which was God's will. The formula was designed to bring about a reconciliation between the Monophysites and the Catholics. "We acknowledge one Will of our Lord Jesus Christ," Honorius wrote. Honorius sent his deacon, Gaios, to a synod in Cyprus in 634, hosted by Archbishop Arkadios II and attended also by representatives from Patriarch Sergius I of Constantinople, a proponent of Monothelitism. The anti-Monothelite side—championed by Maximus the Confessor and Sophronius—sent disciples of these monks to the council together with eight bishops from Palestine. When the two sides were presented to the emperor, he sided with the Monothelites, and thus Sergius and his allies, including Honorius, prevailed. Sergius later composed an "Ecthesis," or exposition, which was issued by the emperor towards the end of 638. In conformity with the words of Honorius it orders all the subjects of Heraclius to confess one will in our Lord. 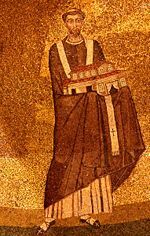 In fairness to Honorius, his own writings do not make it clear that he supported "one will" in the sense that Christ possessed only the will of God and not a human will. Indeed, he seems to lean more toward the idea that Christ possessed only the "one will" of a sinless man united with God. To Theodore of Pharan, the heretic, anathema! To Sergius, the heretic, anathema! To Cyrus, the heretic, anathema! To Honorius, the heretic, anathema! To Pyrrhus, the heretic, anathema! Much later, when the doctrine of papal infallibility was discussed at the first Vatican Council (1869–1870), Honorius became a prime example cited by the doctrine's opponents. Defenders of the doctrine, however, argued that (1) Honorius should not be considered as speaking ex cathedra and (2) rather than being condemned for teaching heresy, he was anathematized for gross negligence and a lax leadership. The Acts of the Third Council of Constantinople argue clearly against the latter proposition, but the doctrine of infallibility prevailed in any case. The many good works of Pope Honorius I were unfortunately overshadowed by his falling into the trap of the Monothelite heresy. Were it not for this, he would be remembered for his successes in evangelizing Britain, bringing schismatics back into the fold, restoring and beautifying Roman churches, and unifying the Catholic liturgical tradition. As it stands, however, the unfortunate Honorius will always be most famous as the pope who turned out to be heretic. Ironically, his own views were apparently not as heretical as they are often thought to be. He did teach that Christ had only "one will," but Honorius seemed to think of this as a sinless human will, rather than as God's will per se. His true failure may have been that he was unwilling to provoke the leaders of the East by pointing out their errors clearly enough.